These cakes are great topped with greens such as kale, though feta cheese or a poached egg are just as tasty. 1. In a large bowl, mix together the sweetcorn, polenta, flour, baking powder, eggs, milk, salad onion, coriander and salt. 2. In a large frying pan, heat a little oil over a medium heat. Spoon 2 tbsp of the mixture into the oil to form a cake; repeat with another 2 tbsp. Brown the cakes for 2 minutes, then flip and cook for another 2 minutes. Repeat with the remaining mixture, adding more oil as needed, to make 12-15 cakes. 3. Meanwhile, blanch the kale in a large pan of boiling water for 1 minute; drain well. Heat a splash more oil in a separate frying pan. Sauté the garlic until just golden, then add the kale; season and fry for 2 minutes. 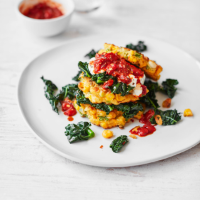 Serve the corn cakes with the kale and a dollop of Greek yogurt and spoonful of salsa, if liked.